Harry Langdon plays a nervous groom and newlywed in his 1925 comedy short His Marriage Wow (1925), available as part of The Mack Sennett Collection: Volume 1 Blu-ray, and the out of print Lost and Found: The Harry Langdon Collection. Absent-minded, Harry first waits patiently for the wedding to begin inside the wrong church, then dashes off hoping to reach the correct church in time. A creepy wedding guest played by Vernon Dent helpfully informs Harry that his bride is so beautiful she must only be interested in collecting Harry’s life insurance policy after they wed. Months later, Harry suspects he’s been poisoned at a family meal, and dinner guest Vernon, now revealed to the audience as a lunatic asylum escapee, offers to drive Harry to the hospital. Will Harry survive their wild ride around 1925 Hollywood? The late Mrs. Eleanor Keaton on the steps of the Seven Chances church, left and above. She joked that whereas hundreds of women before her had failed, she was the one woman to marry Buster. Above, Harry filmed at the Greater Page Temple, 2610 La Salle Avenue, the same church where Buster Keaton confronts a mob of angry brides in his 1925 feature comedy Seven Chances. Harry runs from the church, and below, asks a cop for directions, looking east on 1st at Larchmont. This corner appeared in many films, including those made by the Three Stooges and Harold Lloyd. Larry Fine in Hoi Poloi (1935), Harold Lloyd and family in Hot Water (1924), and Harry Langdon in His Marriage Wow, a panorama at 1st and Larchmont. The home at back still stands. The same view east on 1st at Larchmont – the corner gas station is now a BofA – the home at back still stands. Langdon filmed many scenes from his later short film Saturday Afternoon (1926) at this same corner of 1st and Larchmont, here looking south at the SW corner. Marc Wanamaker – Bison Archives. Again, Harry in Saturday Afternoon, at 221 S. Larchmont. The center-of-the-street poles supporting the former Larchmont electric trolley wires were a popular silent film comic device – above, another scene with Harry from Saturday Afternoon. Returning to His Marriage Wow, thinking his bride is in a taxi Harry dashes north up Edgemont towards Fountain Avenue. The twin bungalow porch roofs at 1259 and 1257 Edgemont St appear to the left, with a corner drug store at back, all still standing today. 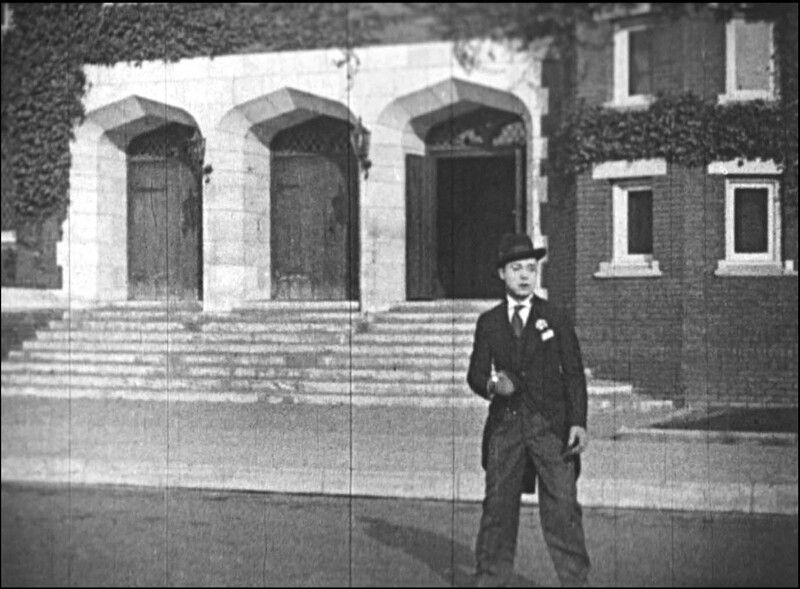 The same porch roofs and corner drug store appear to the left during this shot of Monty Banks also running north up Edgemont during a scene from Derby Day (1922), one of the comedy shorts presented as part of the wonderful Found at “Mostly Lost”: Volume 2 release of previously unidentified early films, produced by, and in some cases accompanied by, noted silent film musician and preservationist Ben Model, in association with the Library of Congress. The transitive theory of matching film locations now kicks in. Once the Monty Banks film (upper right) revealed the corner drug store was named the Ambrose Pharmacy, placing it at the SW corner of Edgemont and Fountain, this clue tied down the prior scenes of Harry and Monty running north up Edgemont towards Fountain. The same corner drug store also appeared in Harold Lloyd’s Hot Water, as Jobyna Ralston straightens Harold’s tie as they travel west on Fountain towards Edgemont. Langdon himself later filmed an early scene here for Saturday Afternoon. 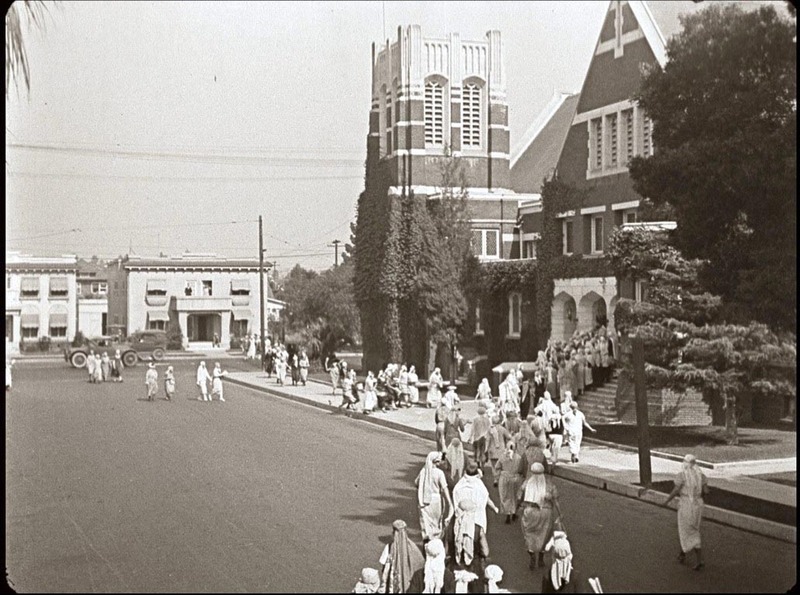 This color view looking west shows the corner drug store building unchanged, while the church to the right behind Harold, Jobyna, and Harry, was upgraded with a 1930 remodel addition now standing flush with the corner. The transitive film location theory yielded more discoveries. Once I became aware of Edgemont Street, I realized that these numerous scenes above, the first two from Lloyd Hamilton’s Breezing Along (1927) (“American Slapstick Volume Two” All Day Entertainment), and the rest from Harry’s His Marriage Wow, were all filmed on Edgemont at the SE corner of Fountain, across from the drug store. The corner brick building, and its back doorway pictured above, still stands, while the classic bungalow originally next door was lost to another commercial building. Above, the back door of 1262 Edgemont, with Lloyd Hamilton, and today. Below, when Harry drops his bride’s wedding ring, it sticks to the tire of a passing car. 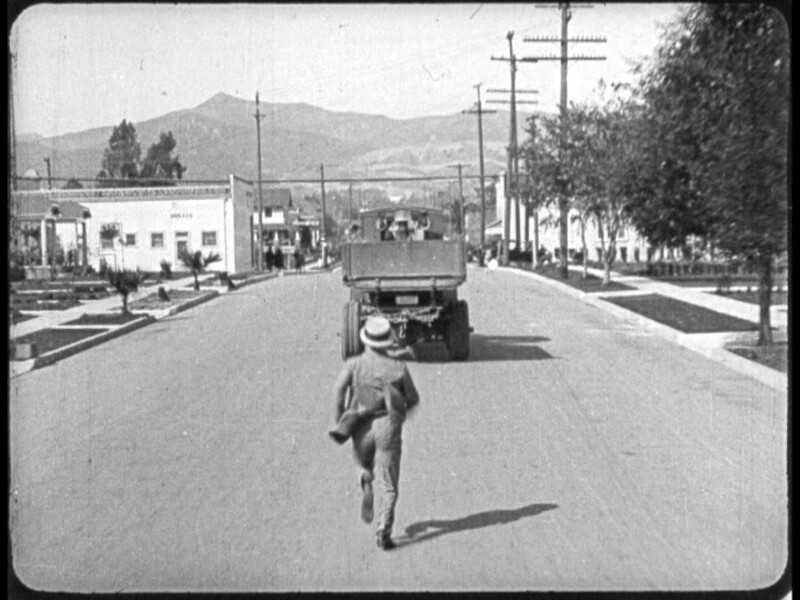 Chasing the car for his bride’s wedding ring, Harry runs north up Larchmont towards the corner of Beverly, matching Buster Keaton’s flee to safety in Sherlock Jr. (1924). The two buildings to the left are the same in each shot. At the time the block, now lined with commercial buildings, still had vacant lots. The building directly behind Harry (ironically now demolished) was not yet built when Keaton filmed here. His Marriage Wow kicks into high gear when Harry accepts a ride with crazy-man Vernon Dent. These two His Marriage Wow automobile scenes and matching Sherlock Jr. scene all show the once elaborately detailed building at the SE corner of Beverly and Larchmont. Looking south down Larchmont, to the left the SE corner of Beverly appearing above, and to the right, the SW corner appearing in the scenes below. LAPL. During their wild ride Vernon drives the car into another center trolley pole. The view below matches Lloyd Hamilton, upper right, in the Roscoe Arbuckle directed comedy short The Movies (1925), at the SW corner of Larchmont and Beverly. Today much of the building’s ornamentation has been removed. Above, Harry and Vernon at left, Lloyd Hamilton upper right, at the SW corner of Larchmont and Beverly. Above, Vernon and Harry continue their wild ride, traveling west along Hollywood Boulevard. Many 1920s-era landmarks appear during the scene, including the intersection of Hollywood and Cahuenga, below, and this view of the blade sign for Grauman’s Egyptian Theater, opening in 1922, with the towering Hotel Christie appearing at back on the corner of McCadden Place, opening in 1923. Later, Vernon and Harry drive west past the intersection of Cahuenga, where the building at 6410 Hollywood Blvd., appearing with Charlie Chaplin and Marie Dressler in Tillie’s Punctured Romance (1914), still stands today. Above, Harry and Vernon then pause in front of the Hollywood Community Bakery (visible sign in the store window), at 1223 N. Vine on the corner of La Mirada. The twin back wall windows have been filled in, but their outlines remain. At left, Buster Keaton follows a potential a bride in Seven Chances. Both views look south down Vine from south of or north of Melrose. The small church at back appearing in both scenes (see small rooftop arch), built in 1922 at 600 N. Rossmore, is still standing. You can read much more about Keaton filming this scene HERE. The Rossmore Apartments, built in 1924, at 649 N. Rossmore Avenue appear at back (yellow oval). 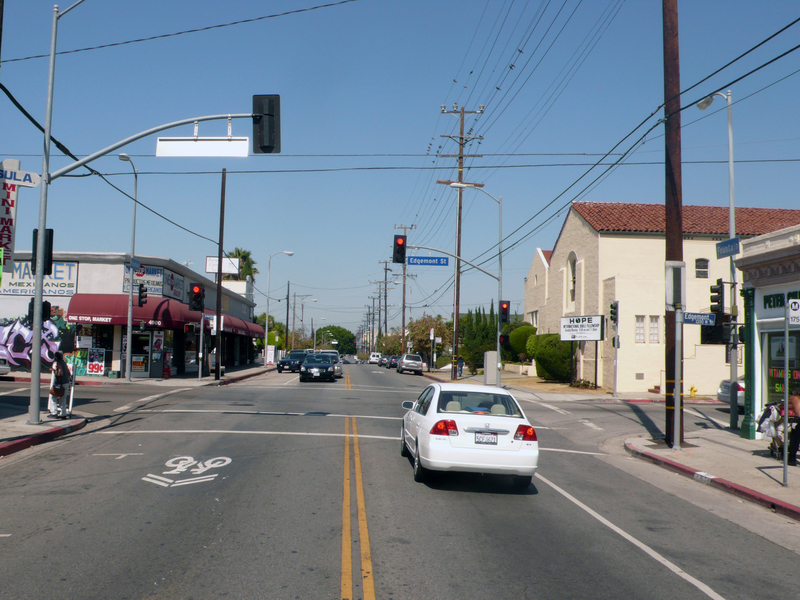 A final shot, Vernon and Harry drive north up Larchmont from the corner of 1st, matching a reverse view photo view. The distinctive building is no longer standing. LAPL. You can read several posts about Harry Langdon’s The Strong Man (1926) HERE, and other Langdon posts HERE. Below, looking south down Larchmont from Beverly. This entry was posted in Harry Langdon and tagged Breezing Along, Buster Keaton, Derby Day, Harry Langdon, His Marriage Wow, Lloyd Hamilton, Monty Banks, Roscoe Arbuckle, Saturday Afternoon, Seven Chances, Sherlock Jr., The Movies. Bookmark the permalink. I’ve been a huge fan of Keaton and Chaplin since the early 90s. I have their features and shorts but I’ve only read about Harry Langdon and saw clips from the series “Hollywood.”I need to watch some films of Langdon. You have a wonderful blog…love the then and now pictures. Thanks Bill – my Keaton – Cops Musso & Frank post shows the *site* of the Egyptian while it was under construction. I could never quite picture the part of Hollywood Blvd where Harry and Vernon were driving in HIS MARRIAGE WOW–now I know! Another fascinating piece of research that will make my LA trips that much more enlightening. I love standing where our favorite comedians once ran/drove!